KINEROS is a distributed model. Multi-gage rainfall input is distributed by assigning rain gages to overland flow planes. Channel transmission losses are also included. Rain splash and hydraulic erosion are an option for overland flow planes; hydraulic erosion for channels. Eroded sediment may be routed through any type of element, even those with noneroding surfaces. The infiltration algorithm will handle a two-layer soil profile and incorporates a new method, based on soil physics, to redistribute soil water during rainfall interruptions. The detention pond model accounts for seepage through the wetted area, rainfall on the pond itself, and initial storage. The open channel algorithm has been extended to allow a compound cross section with an overbank level where hydraulic and infiltration parameters can differ from those in the main section. Base flows can be specified for open channels. 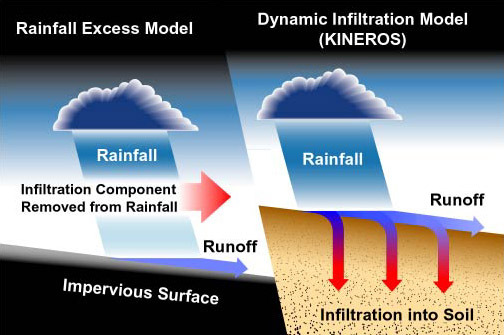 KINEROS2 will automatically interpolate multi-gage rainfall intensity input to each routing element based on the spatial relationship between the element's areal centroid and the rain gage network. Data from the nearest three gages which enclose the centroid determine a plane in (x, y, z) space, where z is accumulated depth, for each time, from which the intensity at the centroid is computed. If the centroid lies outside of the network, and certain geometric criteria are met, two gages are used. Otherwise, data from the closest gage alone is used. Time varying inflow from sources outside the model, such as measured flows or output from other models, can be injected into the model system at any point. The first step is to subdivide the watershed into overland flow and open channel elements, typically using a topographic map. One begins by determining the extent of the channel network to be modeled, which also determines the minimal number of overland flow elements. The figure above shows the minimum number of overland flow elements required to support the chosen channel network. They can then be further subdivided to reflect substantial variations in soils, slope, vegetation, land use, etc. This in turn may require further refinement of the channel network, as each channel segment can have only two lateral contributors, one on each side. Each channel segment can support up to ten upstream elements. Each element is then assigned appropriate parameter values describing its geometric, hydraulic, infiltrative and erosive characteristics, as well as its connections to neighboring elements. When measured outflow data is available, the model is commonly calibrated/validated by splitting the available data into independent calibration/validation sets.